This has been a week full of fun things. It's been busy but great! Monday our preschool had it's first ever "Mom Mixer". A couple of my friends and I helped set up and greet. We have a car line at preschool so I don't get to meet a lot of moms these days. I don't know many of them either so it was nice to meet some new faces. I even set up a play date with a few moms from Will Holden's class. He's so excited. Of course I'm tickled because several of the moms I met are first time moms and are young enough to be MY kids. ha! Tuesday after Bible study Laurie and I had lunch with our friend Terry. She is always a ray of sunshine and we enjoy being with her so much. Will Holden was with us but he was so good. We got to sit and visit for almost 2 hours. Wednesday the girls had a "fun run" at school. It was a fundraiser for our school. They had to get pledges and then ran 30 laps. It was probably the hottest day we have had since the heat of summer. It was soooooooooooo hot. Those poor kids. I was dying and I know they were too. The 4th grade did a color run. They were a mess. They had to both jump in the shower the minute they came home. We are loving our shirts from Life and Laundry! God IS good!!!! Thursday the 4th grade had a musical about the constitution! They performed for the school during the day and for parents at night. It was so cute! Harper and her buddy Jenner. Loving my little Colonial Lady! Harper and one of her sweet friends! Harper got another Stitch Fix box this week. There were several cute things! 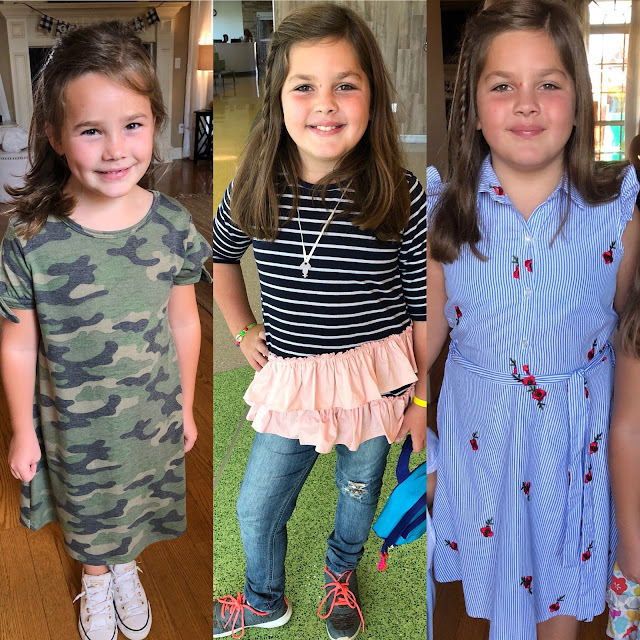 She LOVED the dress on the right and wore it to church already. And the camo dress was too small but Hollis LOVED it and snatched it up. Her favorite thing were the jeans. You can't tell but they have glitter at top on the pockets and at the knee. It has worked so well for us to get her things that fit for decent prices without having to go to a store! Our weekend is jam packed but the good news is it is finally going to be FALL weather!! It's supposed to be in the 60's tomorrow and I can't wait!! !